Astarti Blend – Organic Extra Virgin Olive Oil is a product from the island of Kythera embodying the toil and dedication of the people who produce it. It is the result of the collaboration between the company Astarti, small organic farmers of Kythera and members of the Agricultural Co-operative Society of Potamos. These producers of small quantities of organic oil would otherwise not have the ability to bottle their oil independently. The people involved in Astarti Blend having years of experience, knowledge and commitment to organic agriculture, have adopted the practice of “contractual” agriculture whereby the daily labour and angst of the small independent farmer is rewarded. 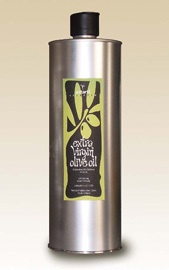 Quality guarantee from the cultivation of the olive tree to your table! Astarti Blend (cold pressed) is a high quality olive oil which is extracted solely by mechanical means by crushing the fruit of the Koronaiki variety olive tree. All stages of production from cultivation through to processing and bottling is certified by DIO (Certification & Inspection Organization of Organic Products) subject to Regulation EC834/2007 for organic farming. Astarti Blend is an organic extra virgin olive oil of exceptional flavour and character, a taste which we trust will satisfy the most discerning palate.